Malaysian TV was filming at Sakaeya! One of biggest Malaysian TV was filming at Sakaeya. Jefferey the funniest Cameraman in the world. MC Adrian funny and cute! own demise. If current dishonest business practices continue, the kimono may begin to lose its symbolism and relevance. This would be nothing short of a tragedy. The kimono was introduced into Japan through cultural exchanges with China between the fifth and eighth centuries. It was at first thought of as underwear, worn with hakama pants and an apron called a mo. In the Muromachi Period (1392-1573), a skinnier take on the modern-day obi belt was introduced, and the mo and hakama were discarded as the kimono became acceptable as a standard garment. The look of the kimono has, according to Liza Dalby in her book Kimono: Fashioning Culture, remained relatively constant since the Edo Period (1603-1867). This continuity in style is remarkable, and should be preserved for posterity. Yet scandals in the industry pose a threat to the kimono’s continued popularity. Stores have been caught charging 100 times what a garment is worth by falsely claiming a machine-made robe has been handcrafted. While a trained eye can easily recognize these fake wares—their unnatural colors make them too perfect—it is difficult for the common buyer to tell. Date selling occurs when salespeople, often handsome young men, take their women customers by the hand and sweetly convince them they need kimono. They allow them to make credit card payments that incur huge amounts of interest, so even young women can “afford” the most expensive kimonos. One young woman recently brought a scarf to our shop, asking us if we could help her recoup some of the ¥319,000 she spent on it. Because of media exposés and increased monitoring by the Ministry of Economy, Trade and Industry, despicable practices like these have diminished, but have not yet disappeared. Deifying the bottom line when it comes to traditional handicrafts is detrimental not only for the consumer, but for independent artisans as well. I know many kimono makers who have been forced to take on part-time jobs to support themselves and their families. These craftsmen have made vast profits for these larger companies, but as demand has fallen, many of their kimonos are rejected now without explanation. At our shop in Omiya, we have been selling kimono at fair prices and have worked to build relationships with our contracted craftsmen. My parents often used to invite them to our shop to show customers how they make kimono. Afterward, we would all have a meal together. I also clearly remember how they struggled. While my father, who passed away 17 years ago, was in the hospital, he expressed regret about going into the business. After he died, my mother became our shop owner. Sometimes she had nightmares and woke up in the middle of the night and was about to cry and say how our shop is dangerous. Sales were not high enough to pay our creditors. One of the reasons we could not survive selling new kimonos is the growing number of cutthroat businesses. Another, even more dismaying fact is that the number of Japanese who cherish kimono has decreased. Last year, thanks to coverage in the mass media, there was a kimono boom and the garment became popular among young women. But this year the trend is over, and demand has fallen. This saddens me—the kimono is part of our national culture, and I don’t believe it should go in and out of fashion. Japan has become a developed nation by constantly engineering new products, but I fear we have done so at the cost of valuing our traditions. One way to regain respect of our common heritage is by enjoying kimono, and by sharing this important part of our culture with the foreign community. Kahori Ochi’s family owns Sakaeya kimono shop in Omiya (www.kimono-sakaeya.com). 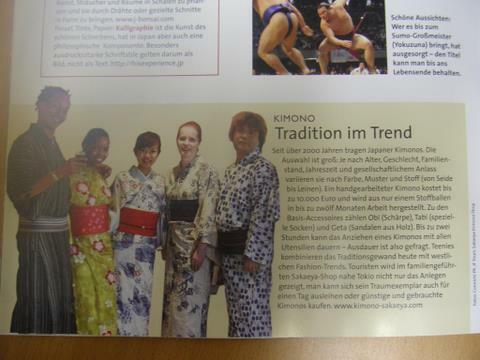 A very popular travel magazine in Germany introduced us! Seit über 2000 Jahren tragen Japaner Kimonos. Die Auswahl ist groß: Je nach Alter, Geschlecht, Familienstand, Jahreszeit und gesellschaftlichen Anlass variiren sie nach Farbe, Muster und Stoff (von Seide bis Leinen). Ein handgemachter Kimono kostet bis zu 10.000 Euro und wird aus nur einem Stoffballen in bis zu zwölf Monaten Arbeit hergestellt. Zu den Basis-Accessoires zählen Obi (Schärpe), Tabi (spezielle Socken), und Geta (Sandalen aus Holz). Bis zu zwei Stunden kann das Anziehen eines Kimonos mit allen Utensilien dauern - Ausdauer ist also gefragt. Teenies kombinieren das Traditionsgewand heute mit westlichen Fashion-Trends. Touristen wird im familiengeführten Sakaeya-Shop nahe Tokio nicht nur das Anlegen gezeigt, man kann sich sein Traumexemplar auch für einen Tag ausleihen oder günstige und gebrauchte Kimonos kaufen. Since 2000 years Japanese wear kimonos. The collection is big: Depending on the age, gender, marital status, season and social occasion they vary according to color, patterns and fabric (silk and linen). A handmade kimono costs up to 10,000 euros (1,250,000 Yen) and will consist of only one roll of fabric and it can take up to twelve months of work to produced it. The basic accessories include Obi, Tabi (special socks), and Geta (wooden sandals). It can take up to two hours, attracting a kimono with all the utensils take - perseverance is needed. Teens combine this traditional garb with Western today fashion trends. In the family-run shop Sakaeya near Tokyo the tourist will not only shown how to attract a kimono they can also borrow the dream kimono for one day or buy a cheap and second-hand kimono. 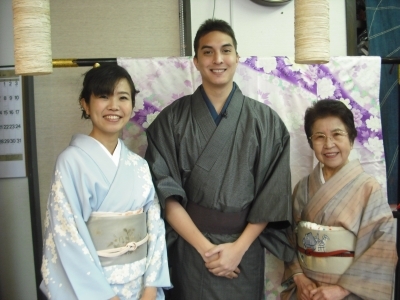 We now offer kimono rental in Tokyo!